Tanjung Puting National ParkUpon arrival in Pangkalan Bun airport meeting service with your guide then direct transfer to Kumai for 20 minutes. 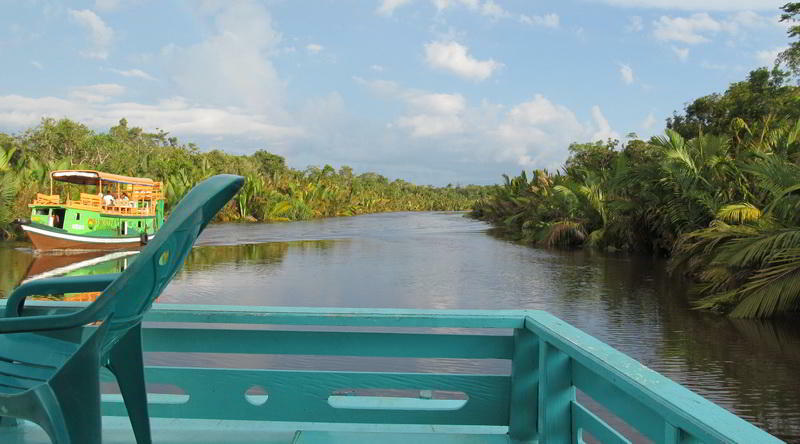 Proceed transfer you up on board and boating down Kumai river to reach Sekonyer river. It will take about 2 hours to reach the first camp Tanjung Harapan. If the time still permitted you will visit Orangutan feeding at 15.00 in Tanjung Harapan Camp. Enjoy your time until 16.00 then boating up to see more proboscis monkey. Meals provided in houseboat and overnight at lodge. 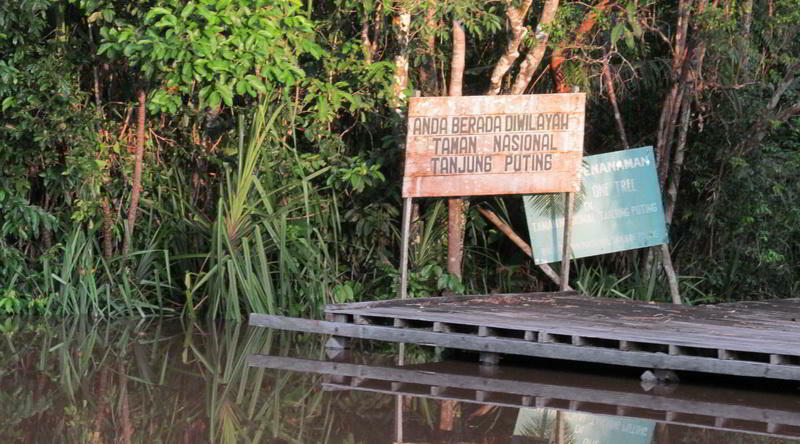 Orang-Utan at Tanjung PutingAfter breakfast, proceed upstream to Camp Leaky area, it will pass the black river. 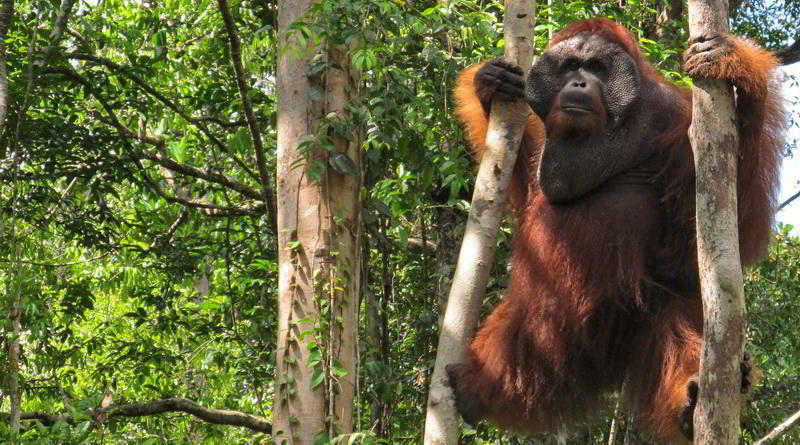 When arrive in Camp Leaky, hiking up to see more wildlife such as Orangutans, gibbons, wild pigs, birds etc. Back to the boat for lunch and at 14.00 will follow the feeding program. Feeders will carry banana and feed the Orangutan on the feeding platform. At 16.00, back to the boat for dinner and return to the lodge for overnight. Orang-Utan at Tanjung PutingAfter breakfast, boating down the river to the second station called Pondok Tanggui. On arrival in Pondok Tanggui trekking up to the Orangutan feeding at 09.00. Enjoying the situation until 10.00 then continue the trip and boating down to Pasalat Camp for your carbon offsetting program. Here you will grow one tree per person as a contribution for slow down the climate change. This is also as a payment for the carbon you had paid from the airline ticket and all the transportation you had used to get here. Afterwards going back to the boat and boating down direct to Tanjung Harapan Camp for visiting the last Orangutan feeding. Here they feed the Orangutan at 15.00 in the afternoon. Enjoy the situation until 16.00 pm. Back to the camp and if it is still enough time crossing to Tanjung Harapan village to see the Malayan settlement activities in the afternoon. Back to the boat and boating down directly to Nipa Palm area to see thousand of firefly. Lunch will be served en-route on board. Dinner and overnight on boat. House boat at Tanjung PutingAfter breakfast boating down direct to Tanjung Kluang beach. It will take about 2 hours to reach the beach. Enjoy the time while you could see the baby hawk turtle in Tanjung Kluang conservation project. Here you could adopt and release the baby turtle (release baby turtle will charge on your own account). High Attention: Watch out there is a poison jelly fish. After breakfast boating up to Kumai, it will take about 2 hours. On arrival in Kumai direct transfer to the airport for your onward journey.